Oh Myyyy! Fans are furious that George Takei doesn't write his own material. Should they be angry? 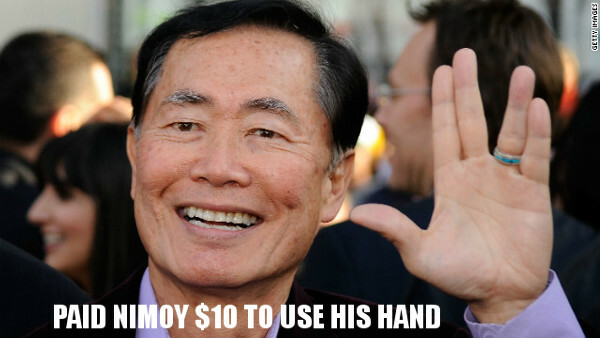 Last week, a comedian accidentally outted George Takei for paying people to write for his Facebook page. TV comedy writer Rick Polito told media blogger Jim Romenesko that he was paid to send memes to the former Star Trek star and Internet sensation. The post says, "He now writes funny lines for George Takei's Facebook page and - even at $10 a joke it still feels like a validation to see so many people reacting to my humor. 'I have written jokes that got 10 likes per second for hours. The power of George is unbelievable. His fans are a viral army. He may not be a stockholder, but he owns Facebook.'" His 4.5 million Facebook fans were outraged, but he laughed it off. Some fans feel "tricked." One fan, Ramona Grigg, said, "Wait a minute, George Takei doesn't write his own stuff on Facebook? That's going to be a huge surprise to his loyal FB fans. Shhhh. (My sympathies to Rick Polito. Poor guy just can't get a break, and obviously he's as talented and funny as, well...George Takei.)" Ian Davis Smith said, "Saw him at a convention and his FB magically updated several times while he was speechifying. More powerto him, though you always know that if you see something funny on George Takei's FB, don't send it to someone internet savvy - it's old news by then." The comedian later apologized. "I wrote an apology to George and Brad and their guy said he’d pass it on,” he told Romenesko in a followup interview Wednesday. “I just said that I’d been looking for any mention of my book I could get and that I hadn’t meant to expose anything. Should Fans Be Mad George Takei Doesn't Write His Jokes? On a sidenote, I know I said I was going to do the "Would You Rather..." polls, but my brother has decided to take it on. So look for a poll twice a week now! What do you think? Should fans be upset that he doesn't find his own memes? It doesn't matter to me. Other comedians have weiters. What happened to my X? I think Zorro stole it. People are really surprised a 70-something actor doesn't make his own Internet memes? Honestly I never thought he actually wrote those. I mean most septuagenarians are not the most tech-savvy people. He's a rich & famous guy who cares enough about his fandom to pay someone to keep us entertained. Judge not. "Let 'im go. Let 'im go!" People get paid to repost memes that are already all over the internet on his fb page? wtf? In even more disturbing news, some personalities hire professional writers to write their blog entries. Oh, the horror!